In a woman’s life, there is no other wardrobe decision more important than her wedding dress. Tulle, lace, and sparkles may fill little girls’ dreams of their dress, but once that little girl grows up and gets engaged, she may realize that finding the dream dress is more about wading through endless options, battling budget woes, and managing conflicting opinions. So how can we save the childhood dream dress from those grown-up worries? Our real brides are sharing their tips for tracking down your perfect dress, from where to shop, who to bring with you, and what to try on. Read on for their advice! Try on different styles to determine what you’re looking for specifically. Bring whoever and take lots of pictures. Afterwards- start researching what you liked. Look up designers and narrow things down. Go by yourself and find the one based off your initial trying and research. Maybe bring 1 trusted opinion. Try it on again and buy it. You have to walk away after the 2nd visit to make sure you love it. Brought my mom and grandma to this visit. I love a good game plan! 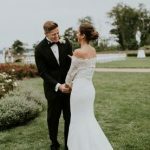 This 3-step strategy removes the pressure of trying to find your dress on day one; instead, think of visit one as fun, visit two as honing in, and visit three as commitment. Most brides we surveyed followed a similar pattern! Reality shows have created serious entertainment around dress-finding drama; we’re all familiar with the large groups of bridesmaids and relatives coming along to the bridal salon, sipping champagne and voting on their favorite dress. While this makes for great television, our brides recommend leaving your entourage behind in favor of a few trusted opinions. I only brought my mom and it was the BEST decision. Such a sweet time and memory for us and since she’s the one who always picks out my favorite clothes/jewelry, it was only fitting. We went to a small, local boutique and it was perfect. We were the only ones there, had the undivided attention of the shop owners and I felt listened to and celebrated. I bought the first dress I tried on! -Sami M.
I just took my mom and I think it was the best decision for me. It was a bonding experience and it helped me to focus because there weren’t a bunch of opinions in the room. 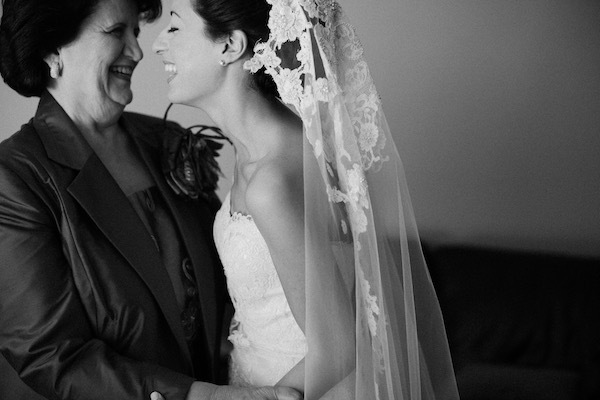 -Camile L.
I brought my mom, mother-in-law, and future husband’s uncle, who is a florist and all-around wedding expert. I knew he would be honest where my mom and mother-in-law would say every dress looked great on me. -Jean M.
I brought my mom, sister, and mother-in-law. It went very well!! I knew they would be honest with me and had my best interest at heart. I don’t regret it! For me, less was more. I only wanted a few opinions to help me decide and it worked so well. It was a special day I will always cherish. 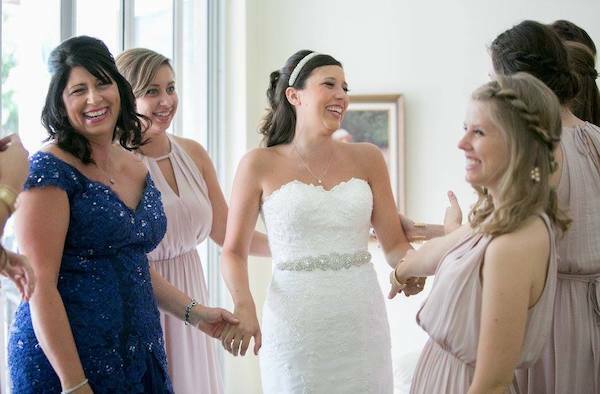 -Janelle P.
Once you’ve decided on your dress, feel free to bring in close family and friends to get a sneak peek. I took my mom, grandma, and sister to shop and it was so special! Especially because of my grandma’s gift to me was my dress! After I found my dress, I brought both moms and all the sisters and my niece back to see my dress. 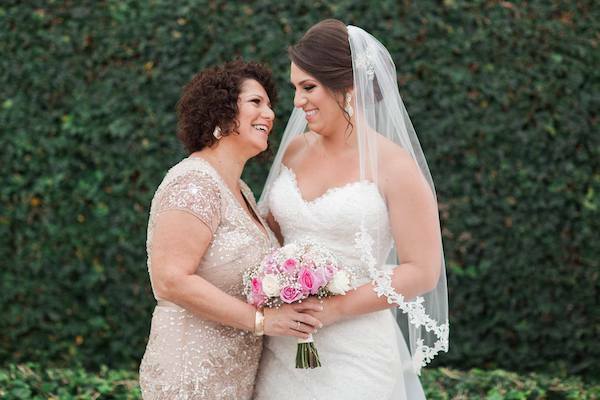 I think it’s so special to keep the initial visit intimate with just your mom or mom, grandma and sister and when your dress comes in to bring everyone! 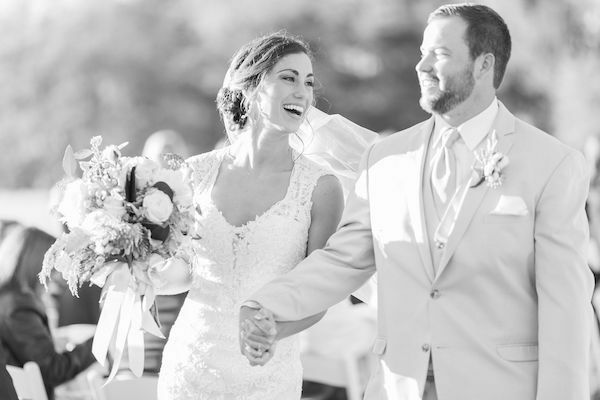 -Tiffany P.
Over and over, our real brides shared the importance of remaining open-minded throughout the process. Dresses look much different on the hanger, and you might be surprised by what you love once you try it on! A tip: Be willing to try on lots of different styles. The dress I chose was not the style I thought I wanted. I knew the moment I tried it on that it was the one for me. -Katie B. Try everything on, even if it’s not what you imagined yourself wearing! Always thought I wanted lace sleeves and all the ones I put on were so not me! -Sami M.
My advice would be to be very open to styles you didn’t think you would like and try on everything because you will be so surprised on what you like. I always said I’d never wear strapless and ended up with a strapless dress and loved it!!!! 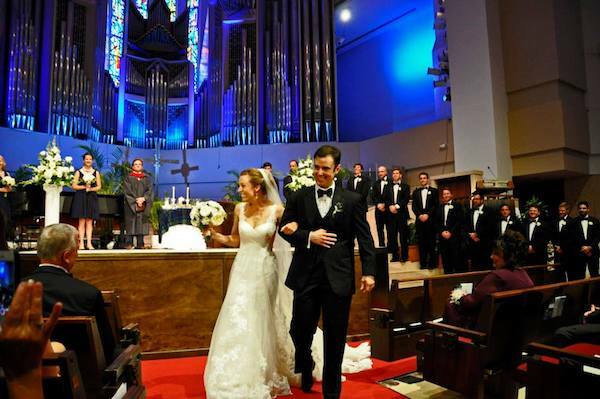 -Tiffany P.
I loved looking for my dress! The best advice passed along to me was to try ALL different kinds of dresses and keep an open mind. It truly helped me find my perfect dress! And when you know-you know. I’m not one to cry over clothing but this dress brought me and my family to tears! -Janelle P.
I would advise people not to skip bridal store chains. I thought they would be filled with bright white, tacky gowns because that’s what I had seen from there. I didn’t realize that the big box chains have so many tiers when it comes to their dresses. They range from $99-$2000, so there’s a lot of variety! In the end, my dress was perfect for me. It made me feel incredibly beautiful. And it was very budget friendly, which was very important to us. 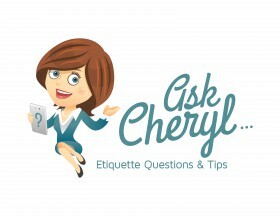 -Camile L.
Whether it’s a boutique or a big box store, the shopping experience still leaves some brides overwhelmed. Could online shopping be the way to go? These brides make me believe it can work! I went to two dress shops with a couple of girl friends, got super stressed out at the prices so ordered my dress on Etsy for $200 and had it tailored for $80! -Kim D.
I was a little shocked when my cousin Rachel told me she ordered her dress online, but she definitely knew what she was doing! How incredible does she look? I did not want to go wedding dress shopping. And one trip to a wedding dress store confirmed how miserable it was. So I decided to purchase my dress online. I put my measurements in and added half an inch to my waist measurement. It fit perfectly. The dress was $140, and it cost $150 to hem. Everything I walked down the aisle wearing cost less than $350 including my veil, which I cut out from a $12 piece of tulle. I loved how I looked and that I didn’t spend a lot on it. -Rachel P.
Another fun option? 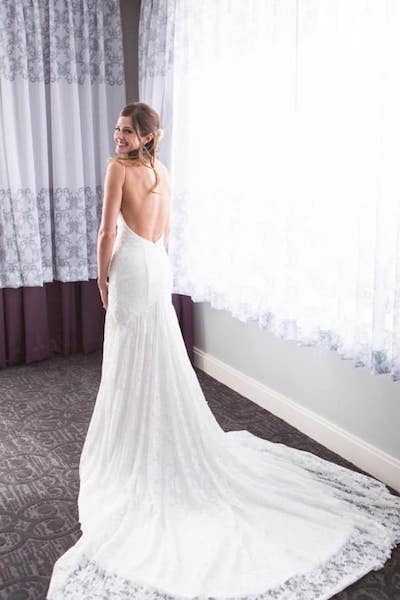 Making your “something borrowed” your wedding dress! Definitely ask to borrow your beautiful sister in law’s dress! -Joy H.
When my future sister-in-law Joy hadn’t found her dress after a few shopping appointments, I emailed her pictures of my dress and offered to let her borrow it for her big day! I hesitated over sending the email, not wanting to pressure her in any way or make her feel obligated. 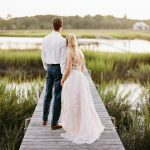 Joy agreed to give it a try, so I shipped my dress from where I live in Florida to where she was living in Virginia, and amazingly, the dress fit with very few alterations needed! It was such a thrill to see Joy in the dress, and I love that someone else got to enjoy my favorite dress in the world! And bonus: my 4-year-old daughter Elle says she wants to wear “our” wedding dress too! My husband is totally taking her up on that in about 25 years! 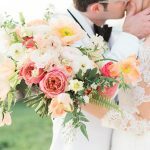 Got a Question for our Brides? We love hearing from you and answering your wedding-related questions! 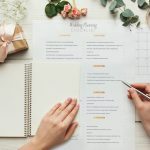 Our brides have covered topics like kids and weddings, wedding splurges and mistakes, handling wedding guest drama and disappointments, using a B-Lists and best wedding gifts! Send us your question, and we’ll be sure to answer it! 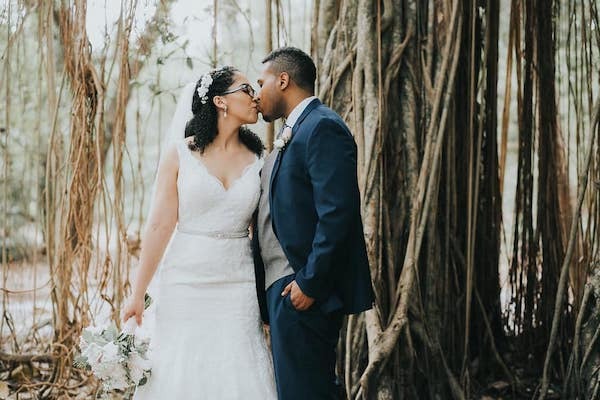 -Written by Christina Peterson, who loved the experience of wedding dress shopping (and all her wedding photos from Kallima Photography)!